The Need – the current linear approach to agriculture removes important nutrients from the soil, passes them through a value chain and discards them in a way that can lead to unproductive soil and negative environmental impacts. There are finite reserves of many key resources and in some cases, such as phosphorus, there is no synthetic alternative. 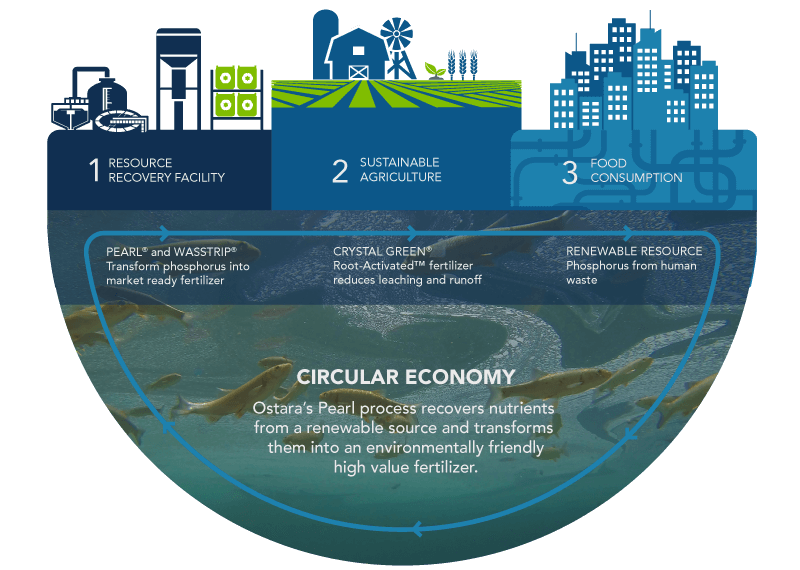 The Solution – Ostara has developed technology that can be incorporated into treatment plants allowing phosphorus and other nutrients to be recovered from industrial and municipal wastewater streams. The product can then be marketed, distributed and sold to blenders, growers and farmers as a pure and effective fertiliser, produced from resources that would otherwise be wasted. What makes it particularly smart – the process reduces the build up of phosphorus and other nutrients, called struvite, on pumps and pipework. This addresses a costly operational issue, common in treatment plants, using biological phosphorus removal. The end product called ‘Crystal Green’ is not water soluble; it releases nutrients to plants in response to growing roots, which means there is a significant reduction in leaching and runoff from crops, as the plants are more efficiently nourished. The Result – wastewater plants have an additional revenue stream, increased efficiency and lower operational costs; nutrient loading to waterways is reduced; fertiliser efficiency is improved for farmers and there is a reduced carbon intensity. The basic template for an urban sewage system has remained unchanged since the 1870s, when the world’s first underground network was installed in London. While Bazalgette’s system was very effective at cleaning up the ‘Great Stink’, its design was extremely ‘linear’ in that it took nutrients from where they are useful (farms), discarding them to a place where they are problematic (waterways). Technology like Ostara’s should be the next evolution of Bazalgette’s ideas, ensuring that the next generation of more ‘circular’ sewage systems not only protect public health but also close nutrient loops back to farmland.